Looking back from today’s perspective it seems hardly worth closing down for only 25 minutes. Surely a caption and music would suffice? But no, we must look at it from the point of view of the perceived corporate needs of Thames. An interlude would have no dramatic or iconic import. Things would merely carry on where they left off. A closedown however, required a start up to resume the programmes. This was an opportunity to promote the corporate identity of the (new) station, to show off the newly composed Salute to Thames march, and oddly to remind the cognoscenti of the ABC heritage of the company, with continuing use of the ABC startup theme Perpetuum Mobile – selected by Thames for a further ‘life after ABC’. In this instance the next programme was the Grand Opening Luncheon of Thames Television – live from the Mansion House – something that would be at its most resonant after playing of the new Salute to Thames march just beforehand. The legacy of Rediffusion can be easily discerned within the Thames output – for the early years at least. 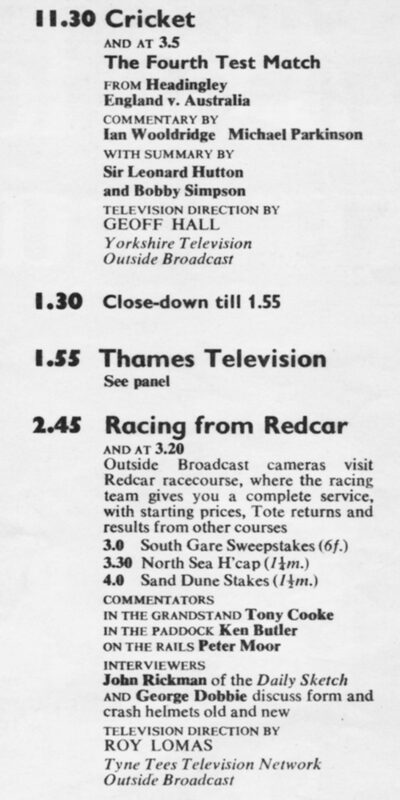 In this particular even the TV Times entry is pure Rediffusion thinking. It was only in the London area that kids programmes had been traditionally grouped separately in the TV Times under the general heading “Children’s Television” and it seems that this was the first of many Rediffusion traditions that Thames carried forward. Indeed it may even have been unthinking continuation by a sub editor of a habit long established. It may not have been Thames policy at all. 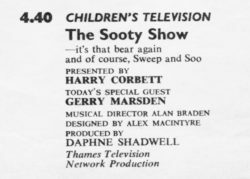 The Sooty Show, perhaps only a footnote in television history now, was at the time a legendary and wildly popular part of the junior culture. 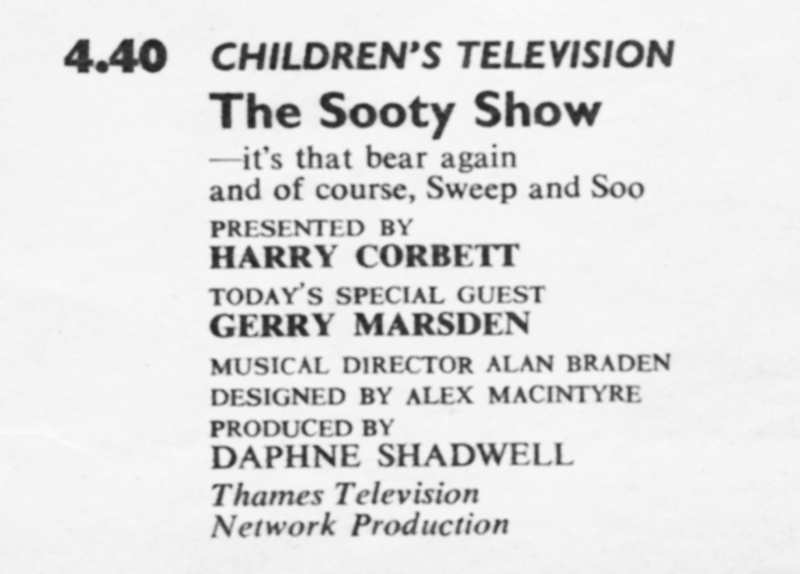 Sooty had appeared on BBC television since the fifties. When it transferred to ITV it was a national newspaper story of supposed cultural significance. It was treated by the press as something of a coup for Rediffusion to have brought the glove puppet star across from the BBC and as of this date it appeared that Thames would continue to exploit the property. The show is here produced by Daphne Shadwell, a long standing Rediffusion producer (and daughter of the ITMA radio band leader Charles Shadwell), and came from Television House. 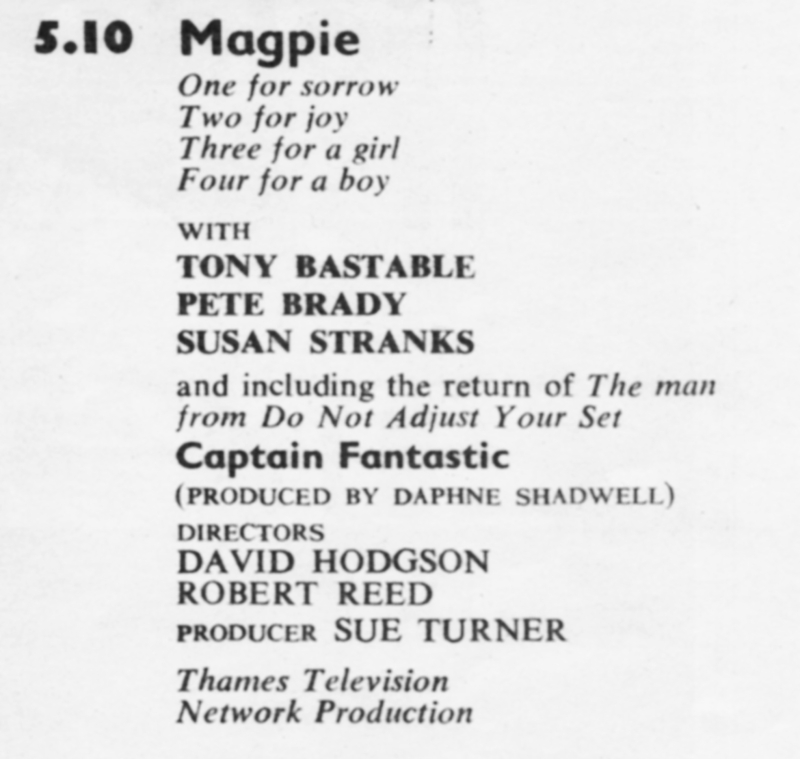 Magpie had been trailed in the press, well before the launch of Thames, as the ‘new look’ ITV’s response to the long standing Blue Peter on BBC Television. 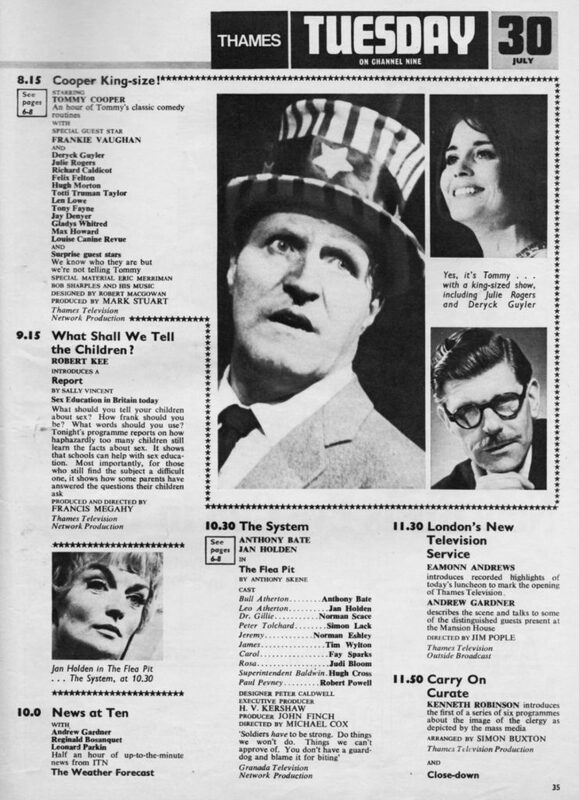 With Blue Peter owning Mondays and Thursdays, Thames chose Tuesdays (and later Fridays as well from 1969) for their new show. From the outset the programme was conceived as a more hip, adolescent and indeed “laid back” event than the earnest middle England tone of Blue Peter could ever allow. The tabloids liked to imply a class rivalry between the viewers of the two shows but many children watched both shows. Some adults later claimed to have been “Blue Peter children” or “Magpie kids” but the tribalism was undoubtedly exaggerated. The engagement of more youthful figureheads than the BBC was using in children’s programmes was a revolutionary start. The new faces were hardly teenage but opposite the ‘mumsy’ tones of Valerie Singleton and Christopher Trace on Blue Peter, they probably seemed very young. To bring real novelty to the programme, one of the presenters was ex-pirate DJ and Canadian (wow!) Pete Brady – though he had already earned some respectability with his new Radio One and Two afternoon show which had followed on after his career on the offshore Radio London had ended, along with the station. 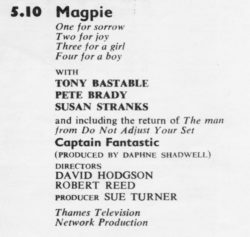 One regular item within Magpie was the spin off feature “Captain Fantastic”. This was a character from the former Rediffusion show Do Not Adjust Your Set, a surreal forerunner of Monty Python. The long standing eleven minute news bulletin at 5.55pm on weekdays was brought forward to 5.50 and extended to fourteen minutes as part of the ITA-led commitment to expanding ITN’s bulletins. This followed on from the successful development of News at Ten, which had started during Rediffusion’s final year, with the transfer of the main evening news from seventeen minutes at 8.55 to half an hour at 10pm. On this day, the lead story of the 5.50pm bulletin was the launch of Thames Television. 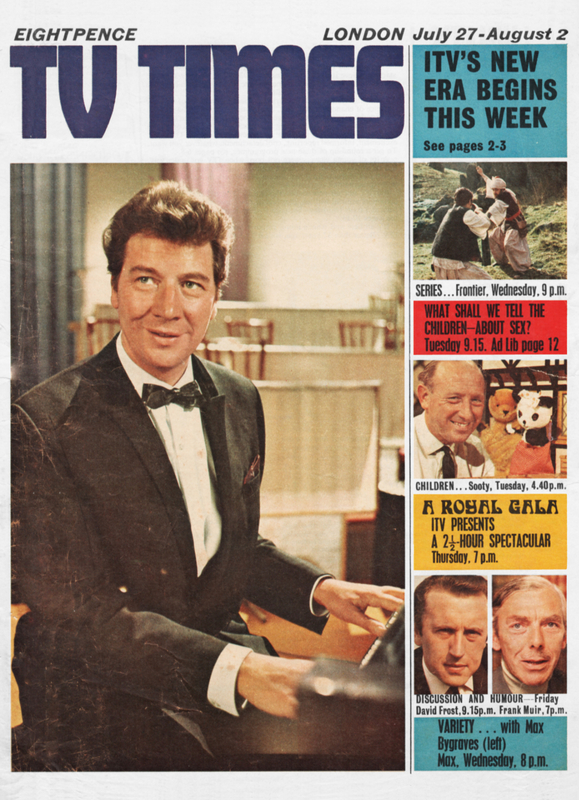 Yorkshire TV had premiered the previous day and Harlech Television earlier in the year – London Weekend was to come later in the week – so Thames remained a solo launch story. 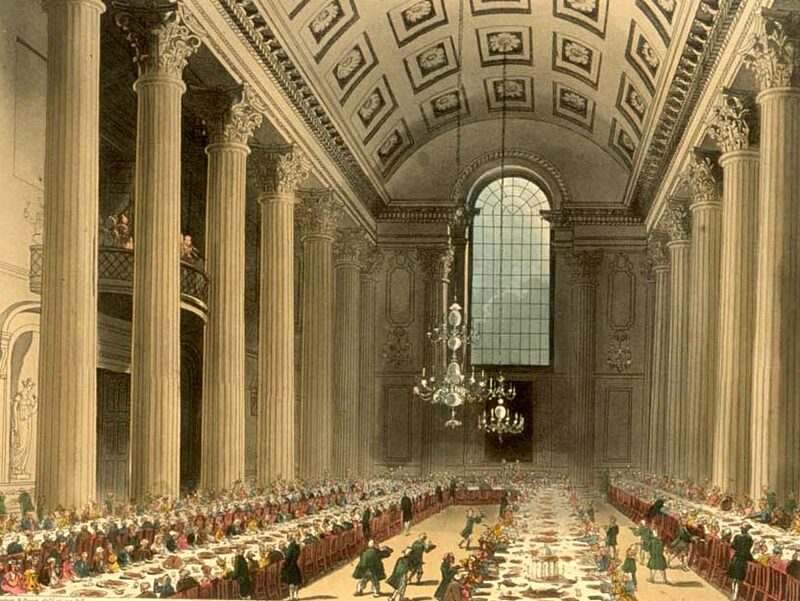 Local viewers had seen the Lord Mayor’s welcoming luncheon from the Mansion House that afternoon and would also be treated to recorded repeats of the speeches at 11.30pm in a round up called “London’s New Television Service”. This was perhaps misleading as it was a new contractor on an existing service – but the TVTimes was playing the ‘Outside Broadcast’ (still then an exciting phrase) for all it was worth. Viewers in the regions had not seen the Outside Broadcast from the Mansion House and so the ITN bulletin included clips from the speeches and a commentary for the innocent provincial viewer outlining the media excitement of the London event. And this was reasonable enough. In our modern multi-channel society, these matters would be assumed of little interest to the viewer – but in an age with just three television services being available to the majority of viewers, the launch of a new ITV contractor for London, even ‘just’ two former contractors with a new name, was considered worthy of being the lead story on the national bulletin. Even the BBC covered it. Under Rediffusion, the space between the news and the programme that followed was filled by Commander Laurie West presenting a full, informative weather forecast with maps and charts and statistics. 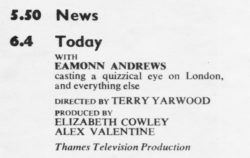 Thames replaced this with the duty announcer reading a headline forecast over a caption, and the weather bulletin disappeared as an item in its own right from the pages of the TVTimes. 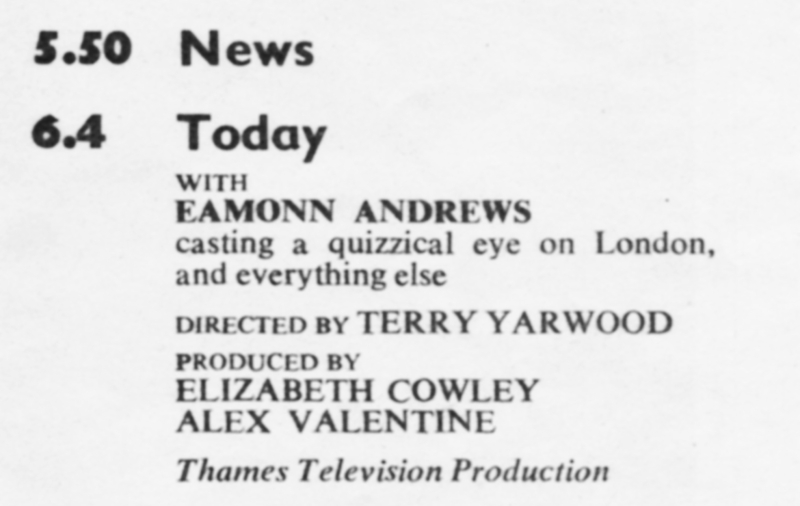 Thames Television’s new Today programme was conceived as the jewel in the crown of their local programming – it was one of the items specified in advance in the original ABC franchise application for the weekend contract. It had originally been imagined as a Saturday roundup of past and future London events and was modelled on the erstwhile ABC Weekend magazine programme previously seen on Saturday nights in the Midlands and North. The formula was to be the same – a roundup of cultural and personality-led events from the area, with an avoidance of the sort of mundane “warehouse fire in Salford” stories that had dominated regional news in the past. When ABC found itself rather unexpectedly in bed with Rediffusion to provide the weekday service in London, the local news commitment was “buffed up” into a planned daily show – on weekdays at least – and the advance publicity stressed the “news for London about London” approach. Exactly what this amounted to was not made clear. The point was made that the show was intended to avoid the trap that Rediffusion had fallen into with their long lived Three After Six local programme – packaging national stories into a local show on the excuse that the capital city was not the equivalent to a provincial region. Rediffusion had always claimed in their defence that the then VHF signals covered the whole South East and so London local news would be of little interest in Bedford, Guildford or Oxford. The option of doing a show for the whole south-east region did not seem to have occurred to them. It was only some years later with the slow transfer of viewers to the smaller region UHF coverage that the London ITV area became a true service for London alone. Thames’s early period in black and white is often overlooked by media historians – but coverage differences between traditional VHF and the new UHF were as much of an issue at the time as the introduction of colour after 1969. Sales of colour sets were initially slow and the majority continued to watch on VHF for several more years – it was 1975-6 before the number of colour TV licences issued was greater than the number of monochrome ones. Thames seem to have painted themselves into a corner with Today in their desire to achieve more for London than Rediffusion had done with Three After Six. From the word go, the new show interviewed stars, musicians and actors, previewed West End hits and reviewed the culture of the capital. 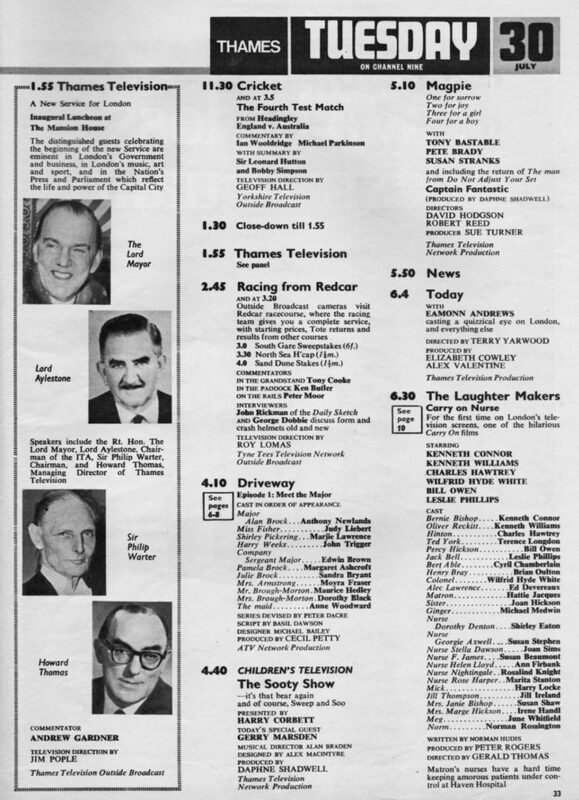 This was probably more to do with the presenter being Eamonn Andrews, a stalwart of ABC ‘sports and celebs’ shows for many years past, who created a more personality-oriented atmosphere than Thames had planned for its main news magazine. The show became a modern version of BBC radio’s famous In Town Tonight of the forties, at least until Eamonn Andrews moved on, tempered only by news of the odd warehouse fire in Wapping….